The Other Side - Hartenbos Akkommodasie. 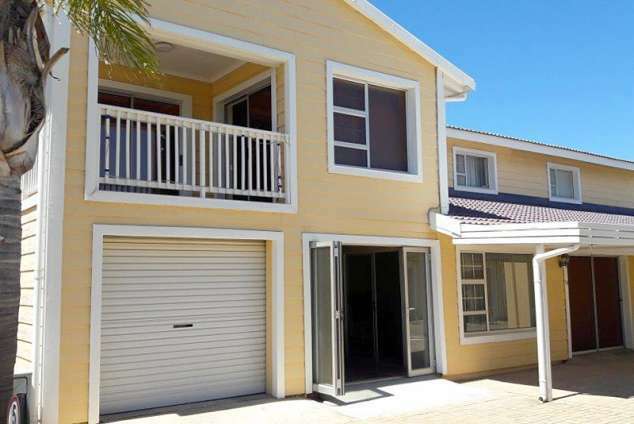 This facility offers quality accommodation for a family or group of friends in Hartenbos. It is close to shops, restaurants, attractions, activities and is within walking distance of the beach (approximately 850m). This double-story house comprises 2 bedrooms sleeping a total of 7 guests. It is ideally suited to a group comprising 4 adults and a maximum of 3 young children. The main bedroom on the first floor has a queen size bed and a sliding glass door opens onto a balcony with beautiful views. The second bedroom (also on the first floor) has a double bed. The first-floor open-plan living area has a three-quarter bed, a double sleeper couch and access to the balcony. This living area is suitable for young children. The open-plan living area is equipped with a TV and DStv. Outdoor furniture is available for the balcony. On the ground floor there is an open-plan kitchen equipped with a stove, oven, microwave oven, fridge-freezer, coffee & tea facilities as well as abundant cutlery and crockery. The dining room has ample seating and the lounge has a comfortable couch and a TV with DStv. A bath, toilet and basin are available in the ground floor bathroom. A washing machine, tumble dryer and ironing facilities are provided for your convenience. The ground floor also features an entertainment area with a built-in braai facility and a fridge. A Weber kettle braai is also available should you wish to braai outdoors. There is parking for only 2 vehicles. One vehicle can be accommodated in the lock-up garage and the second vehicle in front of the unit. There is a retractable awning in front of the unit and outdoor furniture is available to convert this shaded area into a mini patio. The complex has an electric fence and guests have access to a communal pool and a mini putt-putt course for children. 351 besigtings sedert 12 Mar, 2019. Laas opgedateer op 13 Mar, 2019.